In commemoration of the centenary of the First World War, Manuscripts and more will feature a weekly series of short comments on the war drawn from contemporary letters and diaries in Special Collections and Archives. Until the end of September 2014, you can also see original materials as part of the ‘Over by Christmas: Life in Liverpool during the First World War‘ exhibition at the Victoria Gallery & Museum and in the Sydney Jones library. First World War items from Special Collections and Archives are showcased in the multisite Liverpool Libraries Together exhibition, ‘Over by Christmas: Life in Liverpool during the First World War‘. In celebration of the International Festival of Business, the University has opened a pop-up shop in Liverpool One. It will show visitors to the city what life is like on campus for today’s students and researchers. Meanwhile, Special Collections & Archives is showcasing a story from Liverpool’s business community 100 years ago. The Liverpool Philomathic Society was founded in 1825 as a debating and dinner society for businessmen. Membership was men-only and restricted to those ‘in business on their own account’ – i.e. the proprietors of their own businesses. Its purpose was to ‘advance knowledge by discussion’, prove the compatibility of commerce and culture, and enhance Liverpool’s cultural image. The Society’s invited speakers and dinner guests included the American Consul and Ambassador for their Jubilee in 1899, Winston Churchill in 1901, and the Earl of Rosebery in 1908. Seventy-five years after its foundation, the Society was described as “one of the few remaining bulwarks against the flood of feminine invasion of men’s privileges and prerogatives”, and membership remained men-only until 1920. The catalyst for change was the First World War. There must be in the philomathic a lot of chaps like myself who want to do their share. I put it no higher and no lower…. Well I am over fifty five and I am told I am not much good in the ordinary way … yet I am sure there must be a lot of clerical work – letter writing store keeping organizing – they must want help over which I feel I would be of some use. Now there must be numbers like me. War is not all shouldering a rifle. The Liverpool Philomathic Society’s answer was the Liverpool Civic Service League Intelligence Bureau at 30, Bold Street – the present day location of the Halifax – set up by a Philomathic Sub-Committee “to give information to applicants for relief and assistance”. 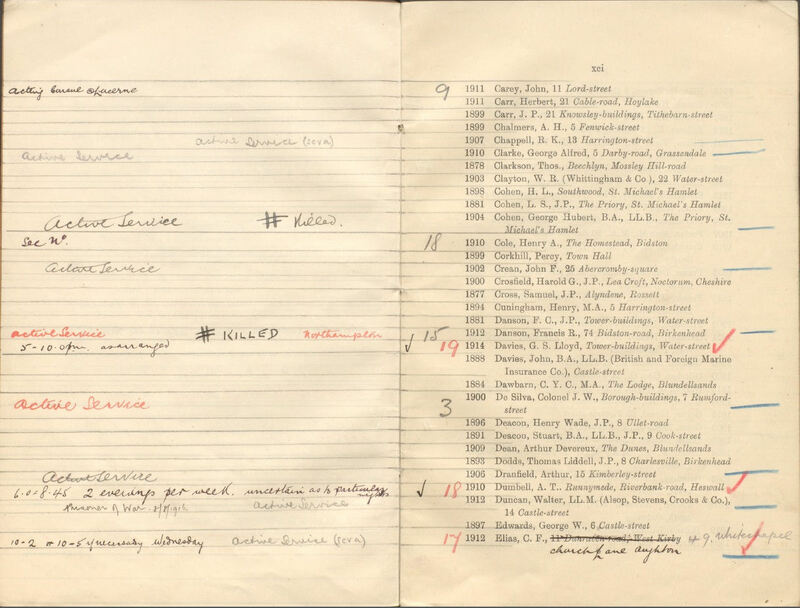 The LPS list of members was annotated to show who was available on which evenings to give information and advice – later annotations showed LPS members’ war service and, increasingly, casualties. and less than a year after the end of the war the Society held its first debate opened by a woman. On the first anniversary of the Armistice, in November 1919, an LPS member, H. Cunningham, wrote looking for advice on a suitable post for his daughter, recently demobbed from the RAF. I must try to whip up the young blood of the Socy to support me but shall lose to a dead cert. The Phil. Soc. is the most Victorian thing I know!! Highlights from the archive of the Liverpool Philomathic Society, and other items from Special Collections & Archives showing the changes brought about by war will be on display at the University of Liverpool as part of the forthcoming Liverpool Libraries Together exhibition Over by Christmas? Life in Liverpool during World War One. Posted in Liverpool pamphlets, Liverpool Philomathic Society	| Tagged exhibition, First World War, Over by Christmas?